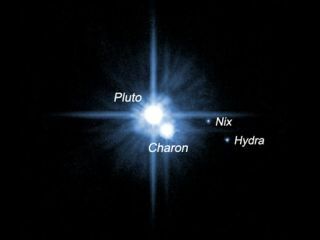 A pair of small moons orbiting Pluto named Nix and Hydra were discovered by NASA's Hubble Space Telescope in 2005. The two moons are roughly 5,000 times fainter than Pluto and are about two to three times farther from Pluto than its large moon, Charon, which was discovered in 1978. When NASA's New Horizons spacecraft reaches Pluto in July 2015, it may find the region more hazardous than anticipated. The discovery of several moons around Pluto — and the potential for more — increase the risks during the probe's flyby. The main problem is debris. The small moons are under constant bombardment from nearby space rocks called Kuiper Belt objects, but the moons' low gravity prevents them from holding on to chunks of dirt and rock that fly into the air when hit. The debris instead finds itself caught in orbit around Pluto, where it could pose a serious threat to New Horizons. "The most likely problem we would encounter is to be hit by something that is large enough to instantly destroy the spacecraft," New Horizons principal investigator Alan Stern, of the Southwest Research Institute in San Antonio, Texas, told SPACE.com. An artist's concept of the New Horizons spacecraft as it visits Pluto in 2015. Instruments will map Pluto and its moons, providing detail not only on the surface of the dwarf planet, but also about its shape, which could reveal whether or not an ocean lies beneath the ice. Though cameras on the New Horizons probe will begin observing the Pluto system several months before its closest approach, they won't be able to detect the fast-flying milligram-size particles that could spell instant death if they collide with the vehicle. Pluto's first known moon, Charon, was discovered in 1978, nearly 50 years after the dwarf planet was found. The Hubble Space Telescope discovered the next two of Pluto's moons in 2005, only two and a half months before New Horizons was launched. In July of this year, a fourth moon of Pluto was located, and there are hints that two more might exist. With three of Pluto's four moons having been discovered in the last five years, scientists have a hunch there are likely more still hidden. Due to these new additions, a group of experts recently convened to analyze the hazards New Horizons might face. After determining the threat was real, they discussed how to avoid it. A harder look at the challenge could make a significant difference, scientists say. Continuing to study the system with the Hubble Space Telescope, as well as several ground-based telescopes, could help reveal other hidden moons and their orbits well before New Horizons arrives. But searching doesn't necessarily mean success. "If there are moons too small, meaning too faint, then we won't find them," Stern said. With that in mind, the group also determined the need for a good "safe haven bailout trajectory," or SHBOT — an orbit that New Horizons could shift into that would keep it away from the most likely danger zones. The best route would zip through Charon's orbit, but on the opposite side of the planet from the moon. The large body constantly clears debris from its path, creating a safe route for New Horizons to pass through. This strategy works best if the debris remains in a plane, similar to Saturn's rings. If, however, it orbits Pluto in a cloud, the danger is heightened. If New Horizons encounters dirt and dust from the moons, it could put an abrupt end to the first mission to Pluto. "There is no wounded here — only dead or alive," Stern said.